The eat well plate in the UK has been superseded by the "Eat Well Guide". 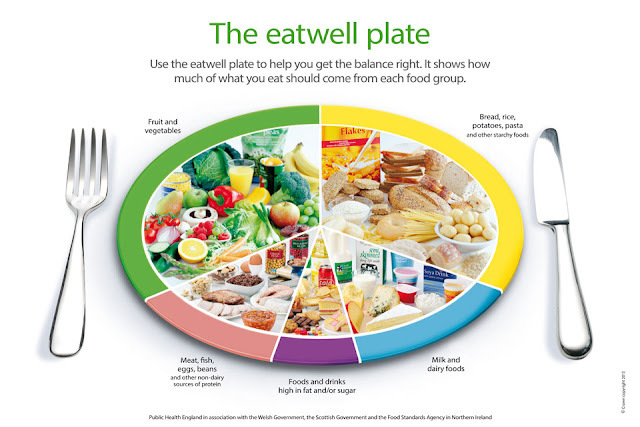 For those of you that don't know, the eatwell plate was an infographic (produced before we started calling them infographics) to give guidance on what to eat. So this is the new version. I should say now that I'm not a dietitian but I am interested in dietetics and food. My opinion on here is no more valid than any other blogger but it is my opinion. This section has grown, however, at least now wholegrain is specified which is slightly better. I think there is a perception though that can be created that whole grain bread is healthy. I had a quick look at a major brand of bread on mysupermarket and their wholegrain version contains 6.3% fibre, whereas their white bread contains 2.6% fibre. Great! More than double! But that's still only 6.3%, it's hardly a product which is full of lovely gut loving fibre goodness? It's not like eating some lovely lentils is it? Bread can also be pretty high in salt. A much better source of carbs (in my opinion) are grains and pulses but pulses are in a separate category. Confusing. Potatoes are also recommended in this category. Although the advice is to eat with "less added fat", it doesn't say "look, chips are not a good idea here". Additionally, here is an article from the Harvard School of Public Health citing that "a cup of potatoes has a similar effect on blood sugar as a can of Coca Cola or a handful of jelly beans". 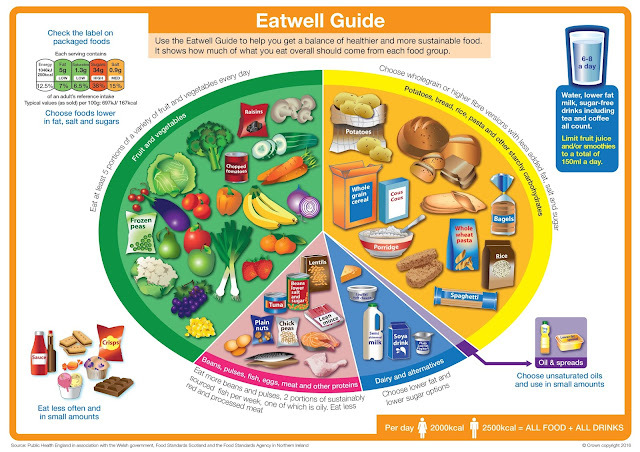 The new Eat Well Guide seems to have more carbohydrates than before. I find this really surprising. Again there is a really interesting article on the Harvard School of Public Health on this. "The data support the hypothesis that adequate calcium intake through milk and milk products in childhood and adolescence is a decisive marker for attaining maximum bone mass (peak adult bone mass) and for the prevention of osteoporosis." Osteoporosis can cause death but also lack of quality of life. This advice just seems strange. A new category but most notably excluding butter. Personally I would rather eat olive oil or butter rather than a hydrogenated fat? Research is unclear in this area but an article in the British Medical Journal certainly seems to suggest that trans fats (which can be caused by the hydrogenation process) are the most harmful. "Meat is fine in moderation – it’s a good source of some nutrients such as protein, iron and zinc. 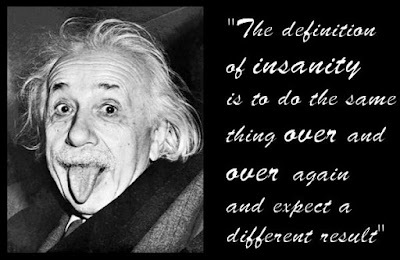 It’s just about being sensible"
But my point is it's confusing. Give one, consistent message. According to the new guidelines; nope, not in your diet anymore. Relegated to the side of the plate. Is this realistic? Does it matter? I'm not sure but this could be so far away from the average person's diet it might seem unachievable. I think this new advice is contradictory to previous advice; I think it's confusing and I think it does nothing to make people really understand what they should eat. For one, people don't make food choices with a plate, it's old fashioned. People make food choices in the supermarket or online shopping or they make choices in restaurants, bars or when buying street food. I don't think this advice is practical, nor is it aimed at where people are making their decisions which is my main issue. I was at an R&D discussion the other day when a researcher said "the biggest change in peoples diets so far has been by stealth". So the subtle changes in salt, sugar and fat levels that people haven't had to think about because the food industry has done it for them. This is a key and alarming message for me. We are not changing behaviours. So by tweaking an existing concept (albeit badly in my opinion) why on earth do Public Health England think it will work this time? Not the eatwell plate but the eatwell supermarket, online shopping and restaurant menu. When I go to the supermarket, my trolley is always half filled (or more) with fruit and vegetables. That is what makes my diet reasonably healthy. If you follow the eat well guide at the top, you could do so only visiting about 4 aisles in the supermarket. The one I visit has about 20. If you give guidance on what aisles to spend the most time in (or the equivalent online) that is more likely to change what food people have in the house than anything else but even then it has to be prepared. If you want to get really nanny state about it, have an "Eat Well Trolley" or even flag up items in online shopping which are high in fats, sugar and salt? Or even better, forget the fancy graphics and BLOODY WELL TEACH PEOPLE TO COOK. Update: Another issue occurred to me this morning while out running. Few foods are easily assigned to a single nutrient. If, say you were vegan and eating pulses as your source of protein, then there is about a third of the protein per g than say, a chicken breast and 20%-45% carbs vs, none in the chicken breast. Now, I think everyone should include a lot of pulses in their diet but if they do, they need to consider that the carb section on that plate might need to reduce a bit. In the same way, how many people fill their basket with non prepared foods? Not many.